With KTM's Crash Bars now back ordered until October of 2010 this is the perfect time to let all of you know that Hepco-Becker's 950/990 Crash Bars are now back in stock and ready to mount on your ride. Pick up your set today and keep those very expensive fuel tanks in one piece. Visit KTM on Facebook and check out their super cool and unique 125 Streetfighter. Unfortunately it isn't coming to the States but that won't stop us for giving credit where credit is due. Keep up the awesome technology KTM. I know we really appreciate it and think our customers do too. KTMTwins.com is proud to announce we have added the very popular and capable Bazzaz products to our RC8/RC8R line up. Their Fuel Control Unit and Quick Shift Kits are on many of the race bikes in the AMA paddock as well as their Traction Control Unit. Have you seen the handguards that come stock on the new KTM 990 Supermoto T? They are the best handguards we have seen for adventure riding and they could be on your bike this week. They are bigger than the stock handguards that come stock on the 950/990 Adventure. They fit most of the models on our site and should fit yours without any problems. They look the part, act the part and are priced just right. KTMTwins.com is excited to offer our outstanding customers free UPS Ground Shipping for a limited time. Enter Coupon Code july2010news for free UPS Ground Shipping to valid destinations. Offer good until September 1, 2010. The KTM 990 Super Duke R is a sweet bike except for the seat. We attempted to offer up our own special comfort seat for the Super Duke R but logistics simply didn’t allow us to keep up with demand. Well KTM has finally done it with their KTM 990 Super Duke Ergo Seat. They finally got enough response to justify their own comfort seat for the Super Duke R and it is on it’s way. Keeping the design lines of the Super Duke was important and KTM’s comfort seat compliments those very well. The seat is made on the stock seat pan and has a layer of foam with a special gel pad on top of that just under the seat cover. This allows your backside to sink into the seat a little giving uniform support. Keep your stock seat for the track and pick one of these up for your commute. Your backside will thank you every time you decide to ride your bike. Replacement Levers you don’t have to finance! If you have had to replace your levers on the 950/990 Adventure or 950 Super Enduro then you know that these are probably the most expensive dirt bike levers ever produced. Well KTMtwins.com did the research and found you a set of KTM 950/990 Replacement Levers that won’t break the bank. They are forged aluminum just like the stock levers, but since they are much cheaper you get to buy both this time instead of having to wait until you get paid to buy the other side. Pick up a spare set today before word gets out and we can’t keep up with demand. Available for both the 950/990 Adventure and 950 Super Enduro. We will have more available for the other bikes in our line up shortly. When you are looking for your next set of Adventure Boots look no further. Sidi makes some of the most innovative foot protection out there. Made in Italy and constructed of the finest Split Grain Leather these boots have all of the bells and whistles that more expensive boots offer but at a more reasonable price. Some of features you can expect from the new Sidi Adventure Boots are an internal waterproof membrane to keep moisture and river water out, shock resistant and anatomically shaped heel protection, replaceable buckle system, removable arch support, Lorica toe shift-brake pad and their unique and innovative ankle flex system. We really think these are going to be the boot of 2011. Available in all sizes and in stock today! We here are KTMTwins.com love it when our customers send us pictures of their pride and joy. Our friend and customer Thorstein has sent us some pictures of his completed 690 Enduro which he has built into a Rally Replica. We hope you like it too. If you have a project bike and need our assistance please don’t hesitate in contacting us so we can use our resources to create something special with you. Thanks Thorstein. Great job! LC8 Oil Filter and Seal Kit finally back in stock! It's been a while. One of our most popular standbys to have in your tool box is KTM's LC8 Oil Filter and Seal Kit. For a couple bucks more than a standard OEM Oil Filter you can have that with all of the seals and oil screens for a complete change over when doing your next oil change. Pick one up today and keep on standby. You will thank yourself later! KTMTwins.com is working very hard to give our International customers options to many of the items that we simply cannot ship Internationally. We have more and more items going up everyday and wanted to start off by introducing some of them here in this blog. Items such as Hepco-Becker Gobi Sidebags in black and grey, Neoprene Fork Seal Protection, Enduro Engineering's Billet Shock Spring Spanner Wrench and Renthal's Twin Ring Sprockets are complimentary items to some of KTM's Hard Parts that are non able to be shipped overseas. We have even added some new items such as Ironman's one year guaranteed carbon steel sprocket and Vortex Adjustable Rearsets for the Super Duke. KTMTwins.com will be working hard to offer all of our customers the best options for your bike and want to take a minute to thank everyone one of our customers for being the best in the industry! Samco has been a leader in high quality hose kits for both 4 wheel and 2 wheel racing for years now and in our opinion have the perfect recipe for radiator hoses. With their multi-layer design to their layer fusing technique they have been a staple in the paddock for years. We are excited to add to the already available kits for the 950 and 990 Adventure, engine kits for all the other bikes on our site. From the 690 Supermoto to the always popular RC8R they have you covered. Don't think of their kits as just some more orange to add to your engine. 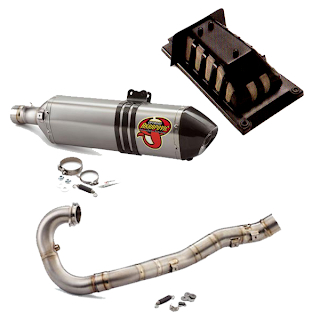 Think of it as a performance upgrade that has been shown to reduce running engine temperatures by up to 7 degrees. All model kits will be available on Twins very soon! 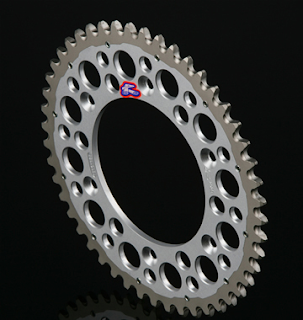 KTMTwins.com is excited to introduce Ironman Sprockets to our line up of gearing choices for your KTM 690. Some of the unique features that Ironman Sprockets bring to the playing field are a 1 year guarantee, lightweight design and a numerous selection of gearing choices. Did we mention these can be shipped Internationally! Want the best of both worlds? We have worked out all of the details so you can have a dirt and street killer in your garage. These KTM 690 Enduro Supermoto Wheels are put together by yours truly so all you have to do is take one set of wheels off and put this set on. Show your buddies on those liter bikes what a supermoto bike can do in the twisties by ordering up your set today! 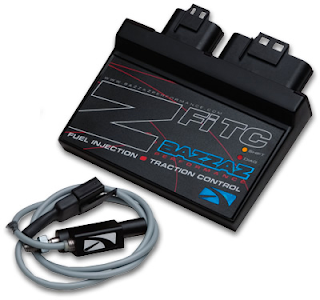 New Bazzaz Electronics for the KTM RC8! One of the big bosses here at KTMtwins works as a Crew Chief in professional roadracing as he is pretty excited that an aftermarket manufacturer like Bazzaz Performance Design sees the value in supporting a smaller production model like the RC8. The BPD stuff is truly plug and play, with basic fuel mapping, closed loop mapping, traction control, and all of the above options. KTMtwins has a full palette of KTM RC8/RC8R Electronics. Keeping with Hepco-Becker’s tradition of offering high quality products that will last the test of time these new KTM 950/990 Xplorer Sidebags and Top Box are just what the doctor ordered. These tough as nails sidebags and top boxes are light weight and waterproof. 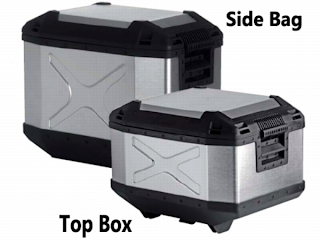 They are constructed of aluminum and protected on each corner with shock absorbing reinforcement polymer. The latches are lockable and like all Hepco-Becker Boxes they offer excellent customer support if you need a replacement part. Order your set today for that summer trip you are planning. 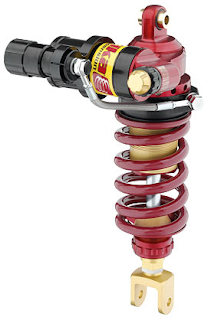 Elka has been a major player in motorcycle and car suspension for some time now and should be a consideration for all of you Super Duke owners when looking for the best damping control for your motorcycle. The Elka KTM 990 Super Duke 3 Way Racing Shock features high and low-speed compression adjust-ability to provide squat and traction control during cornering and acceleration, keeping the contact patch of the tire on the track while allowing smooth absorption of bumps and obstacles. In short, it keeps you glued to the track. These are not an "off-the-shelf shock" - they are custom-built and sprung specifically for you to get the maximum performance for your specific personal use. No need to change the spring or have it re-valved. Install it and ride. After all, that's what it's all about. We have known the guys over at CRG for years now - they design and make some of the nicest products on the market. Their 3 inch round bar end mirrors have been the staple on most high end European and Japanese bikes for years now. Their new CRG LC8 Billet Aluminum Arrow Mirror teardrop design is stylish and functional and looks amazing on every KTM we have mounted them too. The support arm now offers two distinctive adjustments rather than just one. They are a bigger then their 3 inch version due to their teardrop design, but not big enough to take away from the lines on your motorcycle. The best part about them is they mount onto CRG’s bar end adapter so if you already have the CRG’s 3 inch mirrors and want to upgrade - you don’t have to spend the money for new adapters. Looking to open up some more ponies from your 690 Enduro or SMC? KTM and Akrapovic have worked together to offer all of you 690 owners the KTM 690 Enduro/690 SMC Evo 1 Complete Tuning Package that will open the door and let that hidden horsepower out. On top of Akrapovic’s all Titanium Full System you get a new open style airbox allowing more air into the engine. This is the secret to the whole package. With more air in, and more air going out you will allow the engine to breath much better and that makes your engine very happy. This kit will require you to have your local KTM Service Department install Akrapovic’s Open map in order for this kit to run right.